As of April 2015, the Center for Disease Control reports that 1 in 68 children are currently being diagnosed with autism. This serious condition is now somehow touching everyone. It is part of our clinic’s responsibility to be fully informed on the Evidence Based Interventions for treating these children and augmenting our efforts with customized Parent Coaching. Treatment has to be a combination of developmentally appropriate cognitive based play, accommodations provided for sensory integration disorder, appropriate use of all kinds of reinforcers, the as-needed use of augmentative communication devices, and the modeling of speech, language, and social thinking. If this combination is coupled with parents and caregivers fully understanding the concepts driving these strategies, as well as the “how to,” our children progress well. Our goal is to teach our children speech and language…and to insure they know how to play with toys and a playmate, and talk at the same time. Our children are challenged by developing speech and language, and by “thinking socially.” Michelle Garcia Winner has helped revolutionize our understanding that autistic children (and others) are often socially challenged, not just by their speech or language, but by their ability to observe the social situation and interpret what they see so they can plan to behave in such a way that they will elicit a positive response. Teaching social skills requires we first teach social thinking which gives our children the flexibility to observe and understand in any social context…all before they talk! Social thinking starts with activities that teach the children to notice what they see about a person and the surrounding situation so they can share and enjoy an activity with that person. This is all extremely complex and challenging for our children whose brains don’t work this way naturally. 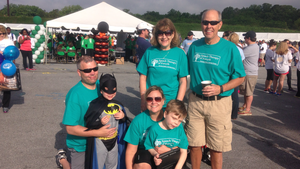 With diligent effort, great strides can be made so their hard earned speech and language skills can be used for its ultimate purpose -- to exchange important information and to personally connect with other people. 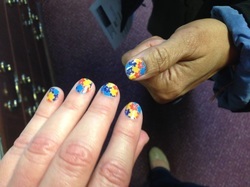 Kari Sykes (SToF Speech Therapist) & one of our moms gets Autism Awareness Jamberry Nails!! !